I attend the Nebula Awards in a few days. I don’t expect to win, but the whole thing is freaky and exciting and a cause for celebration. 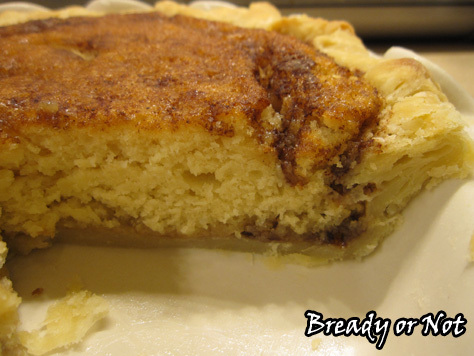 Therefore, I am sharing a special recipe for Snickerdoodle Pie. That’s right. 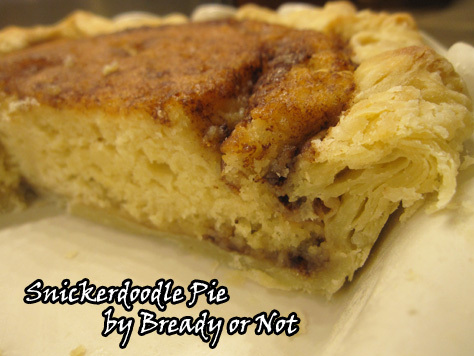 Snickerdoodle Pie. It happens to be a photogenic pie, too, so brace yourself for an onslaught of pictures. 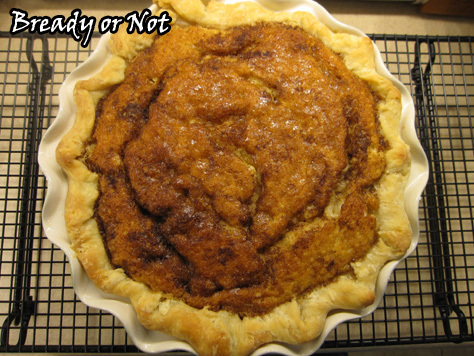 In all honesty, it would be faster to make Snickerdoodle Cookies than to make this pie. The thing is… this pie is awesome. It looks and tastes like you made an extra effort. It really does taste like a giant Snickerdoodle, too. I used my tried-and-true pie crust recipe, which is reposted below, but you can use a store crust or your own reliable recipe. It’s kind of weird how perfectly Snickerdoodley this is, even for being so thick. It’s kind of magical, if magic involves cinnamon, sugar, and cream of tartar. My husband adored this pie. The slices were great straight out of the fridge, but he experimented and found out it’s even better reheated in the oven. Wrap up a slice in some foil and warm it just enough to caramelize the sugar crust some more. Yum! This is a special occasion pie. A birthday pie. A holiday gathering pie. A hey-I was-nominated-for-an-awesome award pie. Plus, if you have pie, you’re a winner no matter what! Modified from the Taste and Tell Blog and the Better Homes and Gardens New Cook Book 16th Edition. A basic, reliable pie shell recipe. 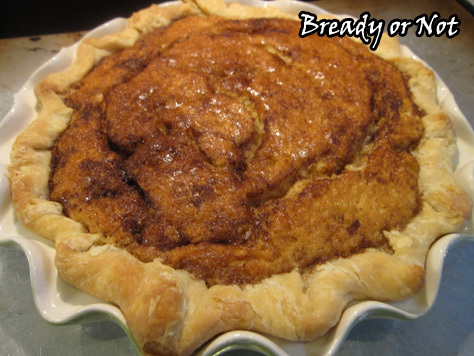 Great for sweet pies! Reduce the sugar, and use for savory pies, too! Make dough hours in advance or the night before. In a medium mixing bowl, whisk together the flour, sugar, and salt. Add in the cold butter cubes, and either use a pastry blender or pulse the ingredients in a food processor until the butter is pea-sized. Pour in the cold water and pulse/mix together until the dough forms a loose ball. I like to use my hands at this point. The dough may be sticky, but it will firm up well. Pour dough onto a floured surface. Divide into two balls and fallen them into discs. Wrap each disc in parchment paper, then in plastic wrap. 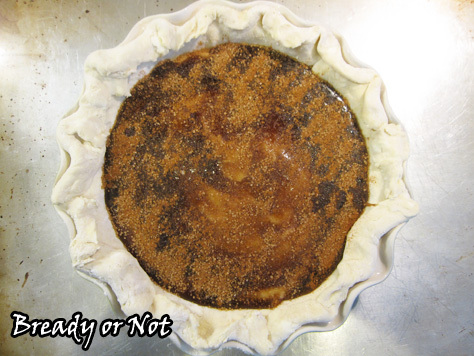 Refrigerate at least one hour before placing in pie dish, or freeze for up to 3 months. Roll out the refrigerated dough into a 12-inch round. Press it into a 9-inch dish, trimming the excess and pinching the edges. Wrap loosely with plastic wrap and freeze at least two hours before using, or keep frozen up to three months. 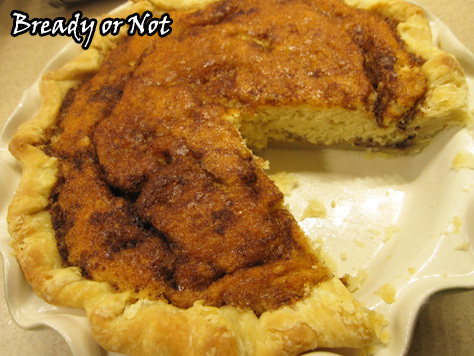 This Snickerdoodle Pie really and truly tastes like a gigantic Snickerdoodle Cookie! The directions include divided ingredients, so read through carefully. The leftovers are incredible cold or reheated in the oven. Recipe modified from Better Homes and Gardens New Cook Book 16th Edition, and the Taste and Tell Blog. Preheat the oven to 350-degrees. In a bowl, combine the tablespoon of coarse or raw sugar and 1/2 teaspoon of the cinnamon. 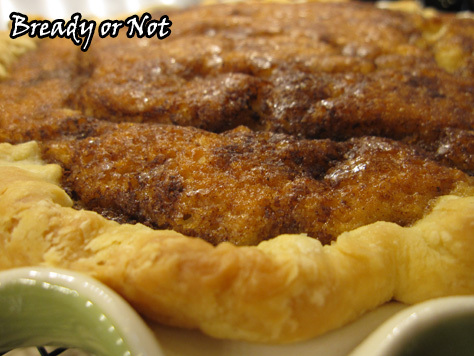 Brush the 1 Tablespoon of melted butter on the bottom of the pie crust, then sprinkle 1 teaspoon of the cinnamon sugar mixture over the butter. Set aside on a cookie sheet. In a small saucepan over medium heat, combine the brown sugar, 1/4 cup butter, water, corn syrup, and remaining 3/4 teaspoon of cinnamon. Bring to a boil, stirring to dissolve the brown sugar. Let everything boil for 2 minutes, then remove from the heat. Stir in 1/2 teaspoon of vanilla extract, and set the pot aside to cool. In a mixing bowl, beat the 1/4 cup softened butter until it's creamy. Add the 1/2 cup of white sugar, powdered sugar, baking powder, salt, and cream of tartar until it's just mixed. Beat in the egg and the remaining 1 teaspoon of vanilla extract. Slowly beat in the milk. Add in the flour until it's just incorporated. Spread the cookie dough mixture evenly in the pie crust. Get the saucepan, and slowly pour the syrup over the top. Sprinkle with the remaining cinnamon-sugar mixture. Cover the edges of the pie with foil or a pie shield; bake for 25 minutes. Remove the foil/shield. Continue to bake about 20 more minutes, until the top of the pie is puffed and golden brown--and looks like a snickerdoodle! Use the toothpick test in the middle of the pie to make sure it's done. Cool for at least 30 minutes before serving. The leftovers are good cold, but are even better if warmed in the oven or toaster oven. Reheat a slice wrapped in aluminum foil at 375-degrees for about 10-12 minutes; it'll get warm through, and caramelize the top.